It was something that I have always wanted to do and an opportunity came up to do it and it felt like this was one of those, ‘if not now, then never’ moments so, as Norman Tebbit – remember him – once suggested, I got on my bike. To be honest, I’m seldom off the thing anyway. I regularly ride to work and, just for the change, I go on long club rides at the weekends. I like riding. Perhaps a little more than that; I’m almost obsessed with it. There were also a whole hill of reasons why I couldn’t or shouldn’t do this. It’s a long way. It’s two weeks out of work and two weeks away from the family. I’d had a health scare 9 months ago. It is a very, very long way. It’s one thing to be good friends with the people you are going to share the ride with but staring at their lycra covered arses for 12 days is next level. Accidents and pitfalls. Pot holes. The rain and the wind. The heat and the cold. Did I mention that it really is a very, very long way? By 2:38pm on May 19th, I had done it. 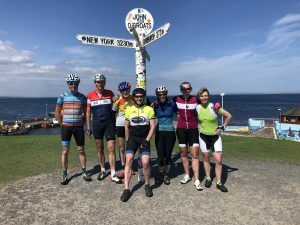 Twelve days after starting off in the mizzle down at Lands End and, in what seemed like the blink of an eye, we had covered the 1027 miles to arrive in John O’Groats on a beautiful sunny afternoon. You know that moment when you achieve something, something that you didn’t necessarily think that you’d be able to? That. It had been an incredible and quite humbling experience to cover the length of the country on two wheels and I think that one of the first things I realised was that I couldn’t have done it without the support of a good wife, good friends and the other six riders. And it’s around about here that these sorts of articles dissolve into fairly obvious business analogies that are all to do with teamwork and effort, commitment and dedication. To be honest, I quite often find those analogies a bit painful, so I won’t inflict them on you. I’ll just share a few of the things I thought about while I was heading north. Firstly, ‘the peleton’. In cycling it’s the pack that you ride with, the group that gives mutual support. I did LEJOG with people I liked the most, not necessarily the riders who I thought were the best. It worked out so well because of the team spirit and working with each other. We all had highs and lows (particularly during a caffeine deficit) but overcame them by working together; telling bad jokes, singing whatever sprang to mind and impersonating every form of wildlife known to man. Secondly, the countryside. When you are riding, the view from the saddle is so much closer, you feel so much more involved. You can smell the landscape, almost taste it. England and Scotland are big, rich and varied countries. From the modern domes of the Eden Project to monumental ruins in Scotland. For every tough, muscle burning ascent there was the reward of breath-taking scenery – and over the 12 days we climbed 61,992 feet. Experiencing the wildlife every single day; red squirrel, capercaillie, woodpecker and cuckoo. Majestic deer, rare sheep breeds and Highland Coo. Then, the people. The general courtesy of other road users and the friendliness of random strangers we met to the low point of the trip; having the support van broken into and the fuel line cut and tank drained necessitating a recovery back to Devon. The pride some people displayed in their homes and the quirkiness of many that you only really get to see and enjoy from a bike. I have no idea what my abiding memories might be. It was such a big experience. Perhaps a sense of scale? It was 6 days before we crossed into Scotland and then we were only half way there. It is, just what you can do if you try. It would have been so easy to be ‘sensible’ and not go. To jog on, in fact. But we planned and we trained and we worked together as a team of friends and LEJOG got ticked off my bucket list.